Global stocks and US equity futures were a sea of red on Monday morning as the Turkish economic crisis accelerated, and the Lira plunge continued even as measures by both the Turkish banking regulator and the central bank failed to stem the collapse in the TRY. 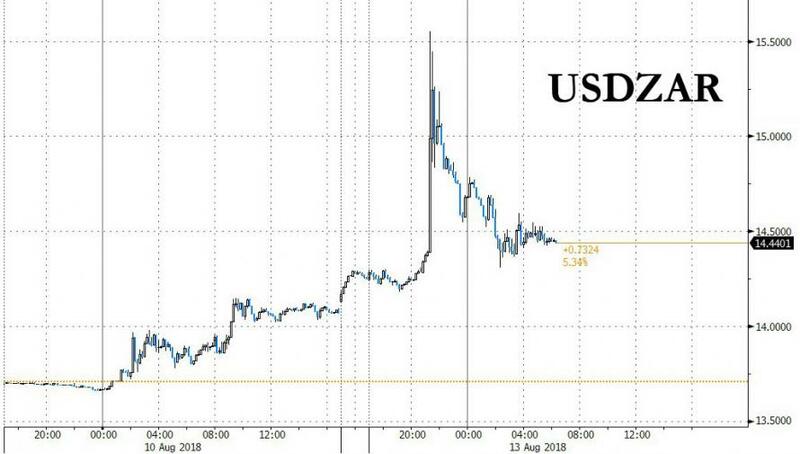 The lira plunged together with the country's equity index after President Recep Tayyip Erdogan maintained his defiance toward the U.S. and refused to change financial track in speeches on Sunday. Erdogan stated the economy is not in a crisis and that weakness in TRY is a currency plot, while he added that "Turkey will win this economic war" and are undergoing preparations to use national currencies for trade with nations such as China and Russia. 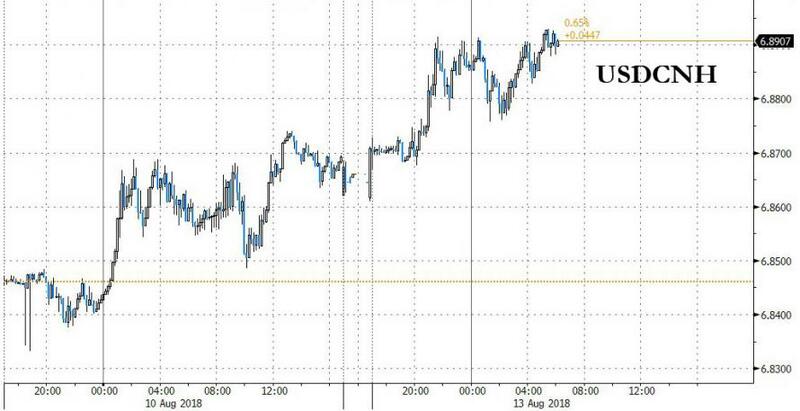 There were also comments from Turkish Finance Minister Albayrak that the government has an action plan regarding the currency and will take necessary measures on Monday to ease market concerns, while he stated they will not convert nor seize FX deposits and that the currency is being directly targeted by the US President. 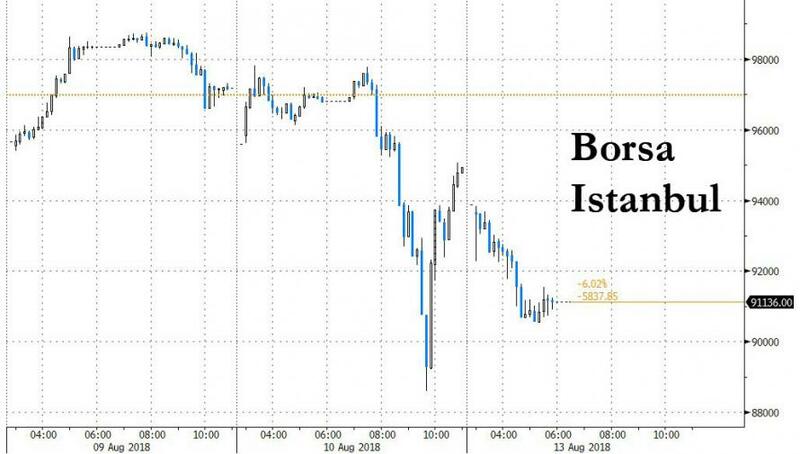 In related news, Turkish Presidency Communication Chief Altun stated Erdogan’s comments were a warning against FX flight, while the banking regulator also announced to limit swap transactions in which banks’ total swap transactions has been capped at 50% of banks’ equity. As Bloomberg notes, the lira’s plunge and subsequent sell-off in Turkey is giving investors a flashback to past crises in emerging markets, especially the Asian currency crisis of 1997, and was rattling nerves worldwide and leaving traders speculating on how bad contagion can get. 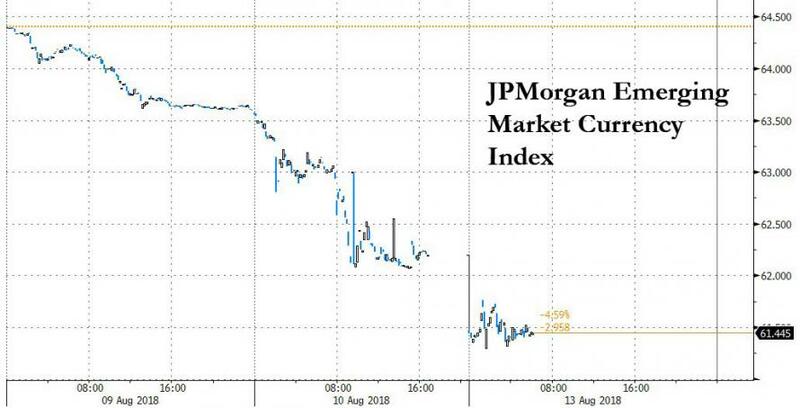 Commenting on the Turkish contagion, Kerry Craig, global market strategist at JPMorgan Asset Management, said that the rout in the lira “may fuel volatility in emerging-market assets and dampen investor sentiment in the near term, as markets are already skittish. But the drivers of the lira’s decline are very specific to Turkey - therefore it should not derail the positive fundamentals in other emerging markets over a longer-term." ... and the JPM Emerging Market FX index continued its plunge on Monday. That said, Emerging Asian currencies pared some losses as central banks stepped in to calm markets. 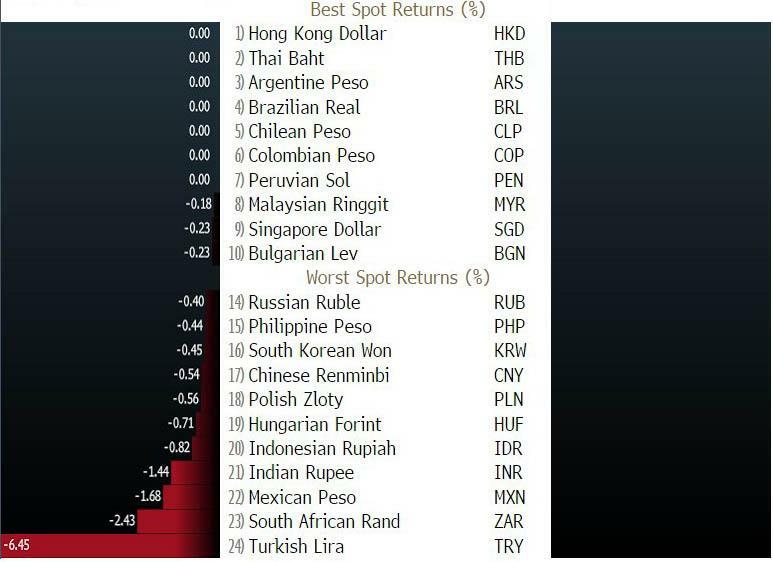 Indonesia and India intervened in the market, while Philippines said it had enough buffers to defend the peso. 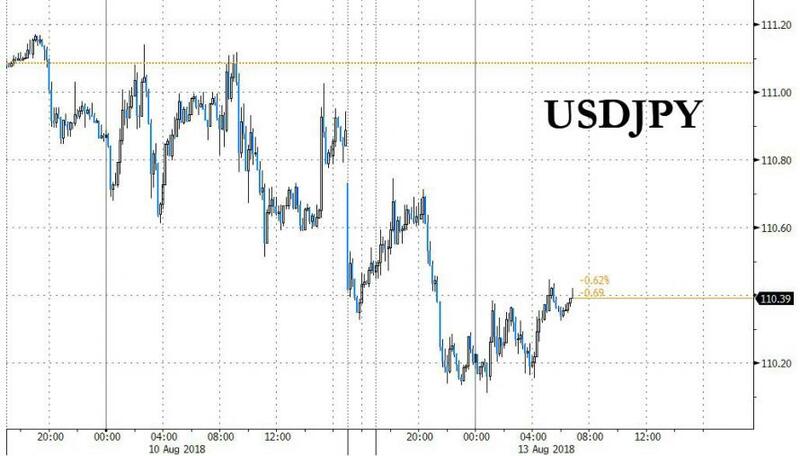 The pressure across EMs spread quickly and the South African rand hit the lowest since June 2016, flash crashing in Asian trading with some noting carry-related selling from Japan, although USDZAR eventually unwound nearly all the move higher. European equity markets open lower, with sentiment in the region soured by contagion concerns as the Turkish Lira extending last week’s slump. As such, Turkey-exposed banks plumb the depths again with BNP Paribas (-1.0%), BBVA (-3.7%) and Unicredit (-3.2%) all near the foot of their respective bourses, even as the early selloff failed to pick up speed and saw little follow through. Elsewhere, Germany’s DAX 30 was dragged lower by its third largest constituent, Bayer (-11.2%), whose shares plunged by the most in almost seven years on concern about the potential costs of a legal battle over Roundup weed killer after recently acquired Monsanto was ordered to pay $289MM in fines as a court ruled the company’s weedkiller caused cancer. Meanwhile, Italian bonds led losses among European sovereign debt markets as the Turkish currency turmoil fueled fears of a contagion effect across riskier assets. Yields on two-year securities climbed to the highest levels in more than a week. As EM currencies tumbled, the yen advanced for second day, approaching the 110 level, as investors shunned risk and turned to safe assets on concern about a spillover from the financial turmoil in Turkey. Japanese government bonds gained along with U.S. sovereign debt. Asian equity markets began the week lower across the board with sentiment similarly spooked on Turkey contagion concerns. The ASX 200 (-0.4%) was dragged down by mining names, while Nikkei 225 (-2.0%) underperformed on safe-haven flows into JPY and with Mitsui Mining & Smelting down 15% post-earnings. Elsewhere, Shanghai Comp. (-0.3%) and Hang Seng (-1.5%) were also heavily weighed alongside the broad EM-triggered mayhem and continued liquidity inaction by the PBoC. The offshore Yuan was trading near session lows for much of the session. South Korea wasn't spared either, with the Kospi index falling 1.9% to the lowest level since May 2017 as foreign investors sold a net 155BN won worth of shares; Samsung Electronics dropped -1.5%, and was the biggest drag on Kospi. Small-cap Kosdaq -3.5% while the MSCI Asia Pacific Index -1.7%. 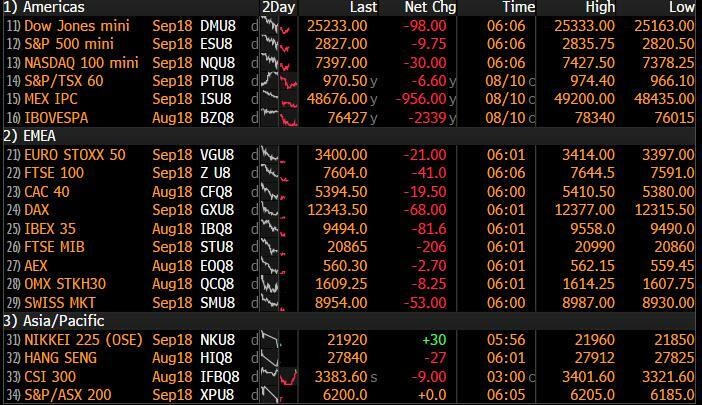 Across the Pacific, futures on the Dow, S&P 500 and Nasdaq were all all lower spooked by big declines across Asian and European markets. 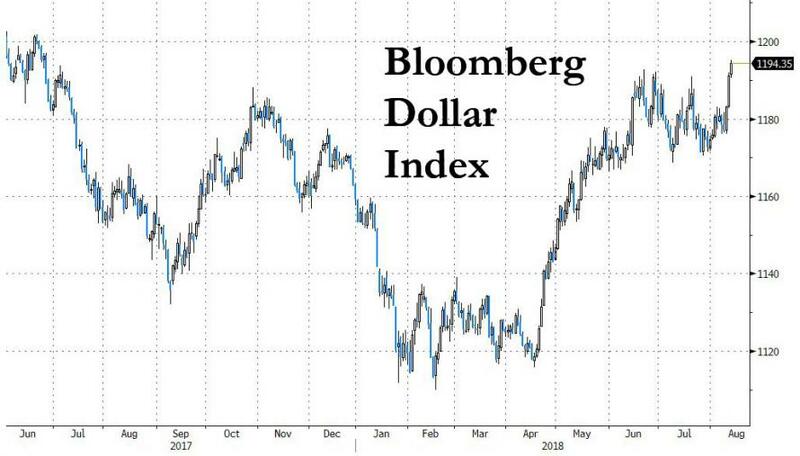 In addition to the strong yen, traders rushed into that other safe haven, the US Dollar, which traded at the strongest in a year as the euro dipped below 1.14. As the dollar surged, gold tested lows near $1,200 an ounce while 10Y TSY yields were slightly lower. In geopolitical news, North Korea reportedly rejected several denuclearization proposals made by the US, while South Korea and North Korea are said to hold a summit in September. Russian Finance Minister Siluanov stated that Russia will further reduce holdings of US securities in response to sanctions, but is not planning to shut down US firms. Additionally, Russian Finance Minister said Russia is to halt FX purchases for reserve, as speculated. Meanwhile, Russia's Kremlin said President Putin has not yet given any orders on drawing up retaliatory sanctions against the US as the scope of planned US measures is unclear. Elsewhere, commodities dropped, with West Texas crude trading below $68 a barrel and base metals retreating. WTI and Brent were in close proximity their 50 DMA to the downside at USD 67.14/bbl and USD 72.43/bbl respectively. Spot gold fell to the lowest since March 15th 2017, weighed by the greenback as the yellow metal detaches itself from safe-haven properties. London copper is subdued on USD action and the risk-off sentiment. India's Oil Corporation says Iran is giving insurance cover for oil shipments, having enough term oil shipments to cushion any Iranian shortfall. There are no economic releases scheduled today; scheduled earnings include Sysco and Stars Group. Asian equity markets began the week lower across the board with sentiment in the region spooked on spill-over concerns as the Turkish lira extended on last week’s slump following a defiant tone from Turkish President Erdogan, which triggered capital control concerns and who labelled the weakness in TRY as a ‘currency plot’. This pressured the major indices from the getgo with ASX 200 (-0.4%) dragged by mining names, while Nikkei 225 (-2.0%) underperformed on safe-haven flows into JPY and with Mitsui Mining & Smelting down 15% post-earnings. Elsewhere, Shanghai Comp. (-0.3%) and Hang Seng (-1.5%) were also heavily weighed alongside the broad EM-triggered mayhem and continued liquidity inaction by the PBoC. Finally, 10yr JGBs were higher with prices underpinned by safe-haven demand, although upside was also capped amid a lack of Rinban announcement with the BoJ only in the market for Treasury discount bills. 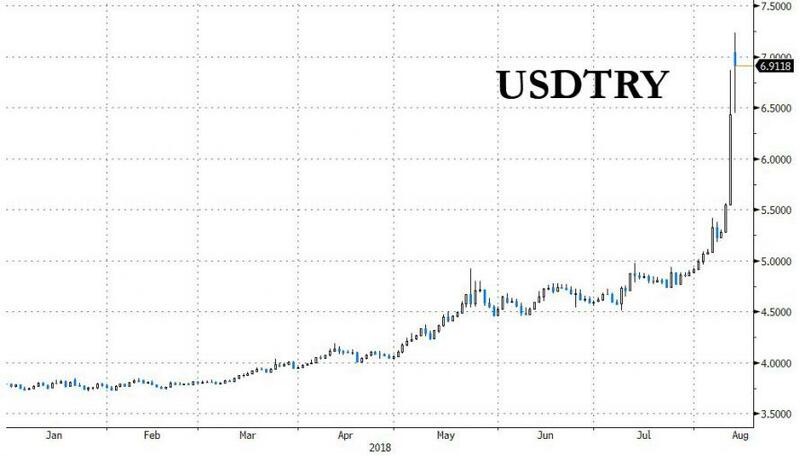 In FX, the Lira remains front and centre of attention after more rousing attempts by Turkish President Erdogan to shore up the currency and coral support from the international investor community largely fell on deaf ears, with Usd/Try soaring through 7.0000 to a new record peak around 7.2150, and prompting the CBRT into action. However, still unable to intervene via conventional means (ie rate hikes) the Bank resorted to cutting Reserve Requirement Ratios for non-core FX liabilities by 400 bp alongside the Lira Required Reserve by 250 bp for all maturities, and the relief has been relatively limited as a result. EM - Lira contagion has spread further across the region, with the Rand hit especially hard (Usd/Zar 15.4700+ at one stage , but the Idr, Twn and other Asian units also weakening to intervention tolerance levels, while the Mxn has unwound more NAFTA-related gains to trade back below 19.0000 vs the Usd. DXY - Riding high amidst all the turmoil in high-beta/risk/yield currency counterparts, with the index just off fresh 2018 highs at 96.530, and now looking at chart targets ahead of 97.000 with fair resistance seen around 96.841. JPY - Still bucking overall trends and outperforming due to its ultra safe-haven allure, with Usd/Jpy pulling back further from 111.00 and through 110.50 to test the water ahead of 110.00 where decent expiry option interest resides (1.3 bn up to 110.05 to be precise). Looking at the day ahead, it's a very quiet start to the week on Monday with the only data of note being the final July CPI revisions for Italy. Looking further out, there are a slew of data releases to monitor. Final July CPI data will print in Germany, France, Spain, the euro area aggregate, and the UK. Euro area core inflation is expected to be confirmed at 1.1%, below the ECB’s target but sufficient for the central bank to maintain its current policy path. Several major US retailers report earnings throughout the week, and July retail sales will print on Wednesday. What is it about August? Without necessarily fact checking, my memory is that August is always a popular month for an EM crisis. Turkey has been negatively bubbling up for a while but Friday’s moves were extraordinary and they are carrying on in the Asian session overnight. Turkey’s problems are quite idiosyncratic and should be relatively well-contained outside of the obvious short-term risk-off unless there’s a major investor retrenchment from EM generally. However, the situation may be emblematic of potential risks going forward as major central banks withdraw their extraordinary policy accommodation of recent years. Financial crises are always likely to happen somewhere in a Fed tightening cycle, especially when a lot of money chased high yielding assets in the easing stage of the cycle. Back to Friday, the Turkish lira fell -13.71% (-19.2% at the lows for the day and now -43.7% YTD) - the third most severe move for the currency since 1990. Five years ago a dollar bought 2.0 Turkish lira, now it buys around 6.74 as we type (-4.6%). Notably the currency dropped to as low as 7.236 this morning, before recovering to 6.58 but then resumed its decline later on. The modest recovery from session lows was in part due to Turkey’s banking regulator stepping in to limit swap transactions on the Lira and the Finance Minister Albayrak telling the Hurriyet newspaper on Sunday that the country has plans to ease investors’ concerns and “from Monday onwards our institutions will take the necessary steps….” without elaborating more (per Reuters ). The two more severe daily moves for the Lira than Friday were in April 1994 and February 2001, which came amid conventional EM crises. In both previous cases, the exchange rate was fundamentally misaligned, twin deficits had risen, and the central bank was overly accommodative. Both crises were eventually resolved through a combination of 1) central bank tightening to discourage capital outflows and reduce domestic demand and 2) IMF assistance to provide firepower and credibility. The currency remained at depreciated levels in both cases. Some combination of these solutions will surely be required again although Turkey could possibly buy itself some limited breathing space by releasing US pastor Brunson. This morning in Asia, markets are trading in a sea of red with the Nikkei (-1.90%), Kospi (-1.80%), Hang Seng (-1.83%) and Shanghai Comp. (-1.73%) all down while risk aversion seems to be benefiting 10y treasuries (yields -2bp) and the Yen (+0.6%). Meanwhile the Chinese Yuan (-0.5%) and Euro have declined (-0.3%) while futures on the S&P are also pointing to a softer start. Elsewhere Bloomberg has cited unnamed sources which noted that Saudi Arabia’s sovereign wealth fund which has built up a c5% stake in Tesla, is exploring how it can be involved in a potential privatisation deal, although no firm decision has been made. Back to Turkey and for those who don’t track the country closely we thought we’d lay out a simple top level explanation of how we go here. The straw that has broken the camel’s back is the diplomatic row over Turkey’s continued detention of the American pastor Brunson, who was arrested and put behind bars back in October 2016 in the aftermath of the attempted coup attempt. Ahead of the US mid-terms this issue seems to have resurfaced and the recent sanctions have further focused the market’s attention on how small, open, indebted, and reliant on overseas capital the Turkish economy seems to be. This year’s Turkish presidential and parliamentary elections were also a big factor in the recent malaise. Spending promises to enhance support at the polls damaged fiscal credibility and encouraged inflation which, with a falling currency, became ever more self-fulfilling. President Erdogan’s speech in London in May where he suggested that high interest rates were “the mother and father of all evil” started to frighten more global investors as did his pledges to take more control over the central bank if he was returned to power in the June elections (per Reuters ). He has repeatedly said that he believes high interest rates cause high inflation which has mystified global investors. Following on from this credibility loss, the Turkish Central bank kept interest rates unchanged in July, despite: consensus market expectations for a 100 basis point hike, inflation rising to almost 16% yoy, downgrades in credit rating by all three major agencies this year, and further deterioration in market sentiment against Turkey. Prior to the last couple of years Turkey has been a darling of international investors as growth outside of the GFC has averaged around 7% under Erdogan’s 15 year watch. Pro-business policies and a youthful entrepreneurial population enhanced the attraction for overseas investors at a time of loose global monetary policy and low returns elsewhere. FDI increased from hundreds of millions of dollars per year prior to Erdogan’s rule to an average of $13 billion a year over his tenure. More recently, headwinds have materialised: global QE is coming to an end, the Fed is tightening policy and the dollar has strengthened. Turkey, like most of the EM universe benefitted from large inflows during the Fed’s large scale asset purchases, as developed market investors were pushed into foreign assets in he search for yield. With the Fed unwinding this stimulus, raising rates and shrinking the balance sheet, associated demand for Turkish assets has declined at a time of erratic domestic policy economically and politically. Historically, financial stress tends to flare when the Fed tightens policy (indeed, the Fed rate hikes in 1994 partially contributed to a prior currency crisis in Turkey). The latest developments are therefore familiar to global investors even if there is always a hope that this time is different. In addition, with Mr Trump signalling a retreat on globalisation and embarking on various trade wars, Turkey started to become exposed to a reversal of proglobalisation flows. So Turkey is in the eye of a potential storm of being a small open economy with large external financing requirements at a time when economic imbalances have built up due to internal politics and a secular shift in global financing conditions from very loose to increasingly tight (especially in the US). So that’s a potted history of the crisis. 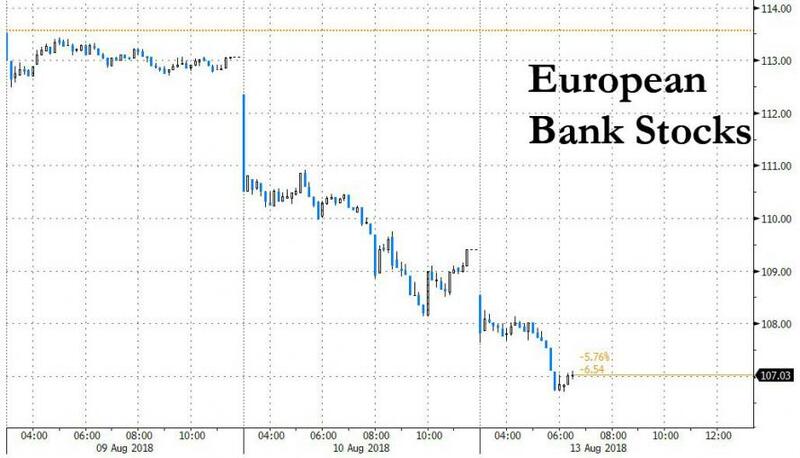 Back to the fall out, European banks were a major victim on Friday with the Euro banks index -3.23% - the second worst day over the last two years. However as our European bank’s team point out there are ‘only’ five European banks (BBVA, Unicredit, ING, BNP, and HSBC) in their coverage universe with a notable presence in and/or exposure to Turkey. Depending on how the situation proceeds, there may be somewhat significant capital and earnings implications for the most-exposed banks, but they do not expect systemic implications and believe the impact should be broadly manageable for European banks. See their note here for details. Elsewhere on Friday the S&P fell -0.71% and the Stoxx 600 closed down -1.07% with core bonds rallying hard with 10yr Bunds and USTs -5.8bp and -5.3bp respectively. 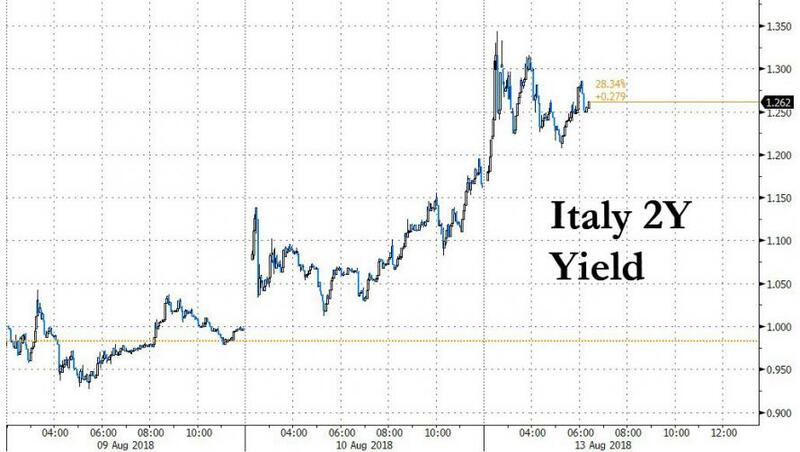 However Italian 2 and 10yr yields rose +16.1 and +9.2bps, weighed down by contagion concerns. Other emerging market currencies sold off in unison with the Lira, with the Argentine peso, South African rand, and Hungarian forint losing -3.84%, -2.62%, and -1.72% against the dollar, respectively. The VIX edged up 1.89 points to 13.16 with the European equivalent (V2X) +2.62 points to 15.11. Following on with Italy, over the weekend the Deputy PM Salvini told the Corriere della Sera that “we’ll dismantle the Fornero Law (part of prior austerity measures to raise the pension age), whether the EU likes it or not”, meanwhile he also added that “the government will do its best to respect EU pacts, but rights of Italian people come first”. Elsewhere, the Deputy President of the Forza Italia Party Mr Tajani noted that “for Italy exceeding the deficit over EU’s limit of 3% of GDP isn’t a taboo”, in part as “we need to exceed it, for example, to pay previous debts that public administration has with enterprises”. Back to Friday but somewhat overshadowed by the Turkey news, July US CPI printed in line with our and consensus expectations, rising 0.2% mom and 2.9% yoy. Core inflation rose 2.4% yoy, its fastest pace since 2008. This pace of price increases is consistent with the Fed’s price stability target. Coupled with unemployment far below their estimate of the natural rate, the latest data will likely support the Fed’s plans to continue hiking interest rates at a quarterly pace. In the UK, the preliminary 2Q GDP was in line with expectations at 0.4% qoq and 1.3% yoy, with household expenditure up +0.3% qoq and business investment +0.5% qoq. Meanwhile the June industrial expectations was slightly above market at 0.4% mom (vs. 0.3% expected).